A republic of South America, bounded by Peru on the north, Bolivia and the Argentine Republic on the east, and the Pacific Ocean on the south and west. Soon after the discovery of the American continent many Jews, professed and secret, settled in the different sections of South America, and changed their places of residence according to the pressure of the Inquisition. At the beginning of the sixteenth century many New Christians ("Christianos Nuevos") who had recently arrived at Callao, Peru, drifted to Santiago, Chile. It was not long before the spies ("familiares") of the Holy Office ferreted them out, accumulating evidence as to their antecedents from Buenos Ayres, Mexico, and the cities of the Old World, until sufficient data had been secured to warrant their apprehension. Thus, an accused Jew would be imprisoned in Chile, tortured until he confessed, and, sometimes after languishing for years in the secret dungeons of the tribunal in Santiago, finally be surrendered to the secular arm for execution in Cartagena or Lima. The martyrdom of the scholar and theologian Francisco Maldonado de Silva, whose trial was a cause célèbre, is a case in point. He suffered imprisonment in Chile, and was burned at an auto da fé in Lima Jan. 23, 1639. Nor was his case an exception to the rule. In the following paragraphs will be found the first summary in English of these trials for Judaizing. The case of Luis Noble or Luis Duarte (see Duarte) is probably the first on record. A Portuguese by birth, he served as a soldier in Chile, and was arraigned before the tribunal at Callao for stealing a crucifix. He confessed to being a Jew (Aug., 1614). Duarte does not seem to have been severely dealt with, escaping with a whipping and a light sentence. From 1636 to 1641 the following persons were accused and punished for Judaizing: Antonio de Acunha, from Arronchez, Portugal, aged 24 years; Antonio Corderes; Diego Lopez de Fonseca, from Badajoz, aged 40 years; Manuel Baptista Perez, merchant, aged 46 years; Manuel de la Rosa. 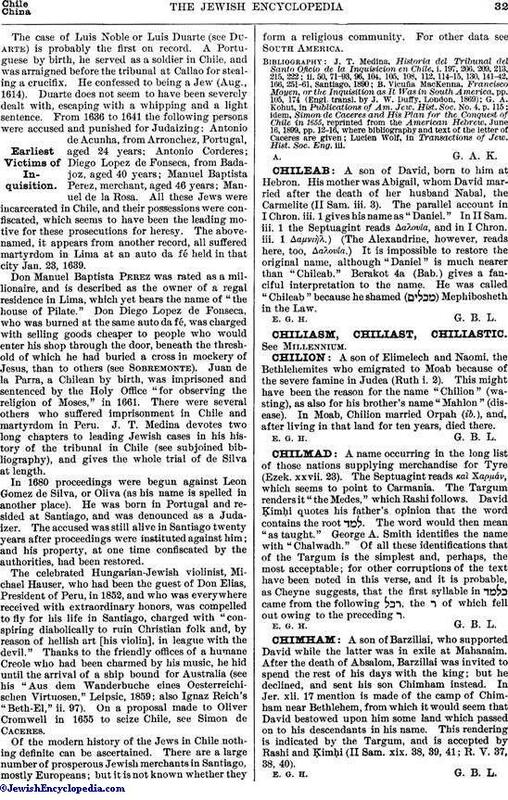 All these Jews were incarcerated in Chile, and their possessions were confiscated, which seems to have been the leading motive for these prosecutions for heresy. The abovenamed, it appears from another record, all suffered martyrdom in Lima at an auto da fé held in that city Jan. 23, 1639. Don Manuel Baptista Perez was rated as a millionaire, and is described as the owner of a regal residence in Lima, which yet bears the name of "the house of Pilate." Don Diego Lopez de Fonseca, who was burned at the same auto da fé, was charged with selling goods cheaper to people who would enter his shop through the door, beneath the threshold of which he had buried a cross in mockery of Jesus, than to others (see Soberemonte). Juan de la Parra, a Chilean by birth, was imprisoned and sentenced by the Holy Office "for observing the religion of Moses," in 1661. There were several others who suffered imprisonment in Chile and martyrdom in Peru. J. T. Medina devotes two long chapters to leading Jewish cases in his history of the tribunal in Chile (see subjoined bibliography), and gives the whole trial of de Silva at length. In 1680 proceedings were begun against Leon Gomez de Silva, or Oliva (as his name is spelled in another place). He was born in Portugal and resided at Santiago, and was denounced as a Judaizer. The accused was still alive in Santiago twenty years after proceedings were instituted against him; and his property, at one time confiscated by the authorities, had been restored. The celebrated Hungarian-Jewish violinist, Michael Hauser, who had been the guest of Don Elias, President of Peru, in 1852, and who was everywhere received with extraordinary honors, was compelled to fly for his life in Santiago, charged with "conspiring diabolically to ruin Christian folk and, by reason of hellish art [his violin], in league with the devil." 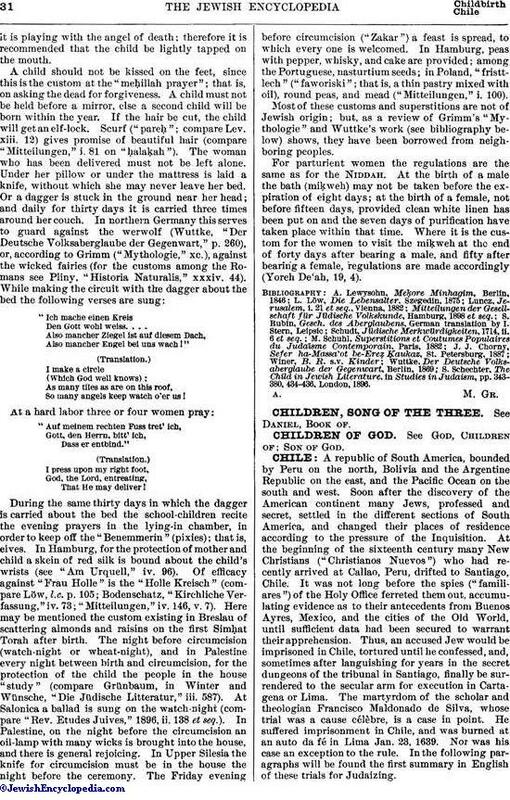 Thanks to the friendly offices of a humane Creole who had been charmed by his music, he hid until the arrival of a ship bound for Australia (see his "Aus dem Wanderbuche eines Oesterreichischen Virtuosen," Leipsic, 1859; also Ignaz Reich's "Beth-El," ii. 97). On a proposal made to Oliver Cromwell in 1655 to seize Chile, see Simon de Caceres. Of the modern history of the Jews in Chile nothing definite can be ascertained. There are a large number of prosperous Jewish merchants in Santiago, mostly Europeans; but it is not known whether they form a religious community. For other data see South America. Lucien Wolf, in Transactions of Jew. Hist. Soc. Eng. iii.